The most significant use of cement is production of concrete and mortar. Cement mortar can be used for masonry work, plaster, pointing, etc. 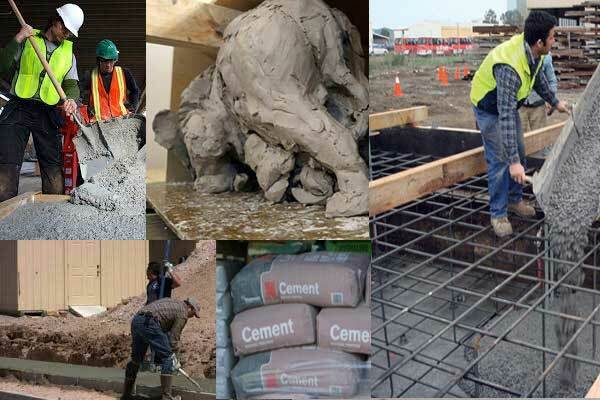 Cement concrete can be used for laying floors, roofs, constructing lintels, beams, weather sheds, stairs, pillars, etc. It can be used for construction of important engineering structures such as bridges, culvert, dams, tunnels, storage reservoirs, light houses, docks, etc. It can also be used for construction of water tanks, tennis courts, septic tanks, lamp posts, roads, telephone cabins, etc. It can be used for making joints for drains, pipes, etc. It can be used for manufacturing precast pipes, garden seats, artistically designed urns, flower pots, dust bins, fencing posts, etc. It can be used for preparation of foundations, watertight floors, footpaths, etc. It can be used for creating fire-proof structures in the form of concrete. Also, it can be used for making acid-resistance and waterproof structures. Colored cement can be used for decorating or coloring the structures. It can be used for shotcreting the tunnel or geological walls to strength the structure. Structure once build out of cement are difficult to be displaced or reused. They can’t be easily recycled like plastics or steels. Cement structure are very heavy. So, while building skyscrapers, it can’t be totally build on cement. Instead steel structures are placed.